In a hospitality environment at times overcome with monotony, The Last Word prides itself on offering a distinct five-star experience. Treating guests like royalty, the family run business offers personalised hospitality in picturesque locations surrounded by exquisite style and elegance. The Last Word is a novel, out-of-the-ordinary concept which encourages visitors to Cape Town to participate in an all-encompassing travel experience by offering the best and easiest way to see more of the Mother City. There are three intimate hotels in the portfolio – all three are in picturesque, luxurious locations. By combining stays at these different hotels visitors can experience the versatility of Cape Town and its surrounds while enjoying the memorable service and hospitality for which The Last Word is renowned. It is common knowledge that Cape Town is the African Riviera; the playground of the continent. In keeping with this reputation The Last Word intimate hotels are located in the best settings the city can offer, away from the madding crowd. Once off the highway, the easy 75 kilometre drive takes guests past internationally-renowned vineyards to The Last Word Franschhoek - a hidden gem in a charming destination. Always well received by local and international guests, this intimate hotel has a light, fresh feel that delights the sixth sense. The lounge is open plan to the bar, reception, dining and pool areas so there’s an easy flow between the communal sections. All rooms have new plasma TV screens. Two suites have private plunge pools and Pool Suite 2 has a private dining area. History abounds here in this valley which is sheltered by the Middelberg, Groot Drakenstein, Klein Drakenstein, Wemmershoek and Franschhoek mountains. The village was named after the so-called Huguenots who fled homeland France, in 1685, after the revocation of the Edict of Nantes and the prohibition of Protestantism. It’s the food and wine heartland of South Africa. Activities in the area include gourmet wining & dining, boutique shopping, walking & hiking, mountain biking, wine tasting, chocolate tasting, cheese tasting, world-class restaurants, historic buildings & museum, championship golf courses, bicycle hire, wine tasting on horseback. 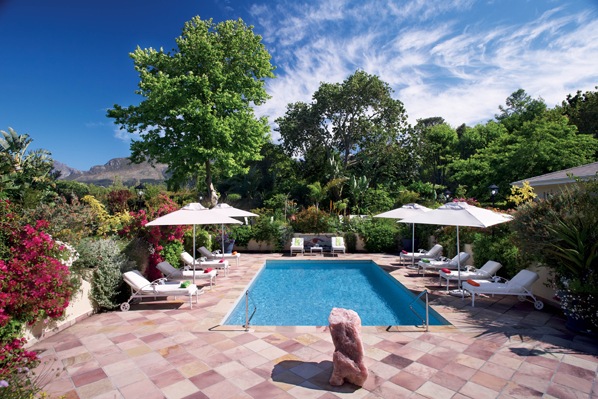 Vibrant indigenous flora and vivid exotic plant life create a tranquil and serene ambience at The Last Word Constantia, a superior nine-roomed intimate hotel in Cape Town’s oldest wine valley. 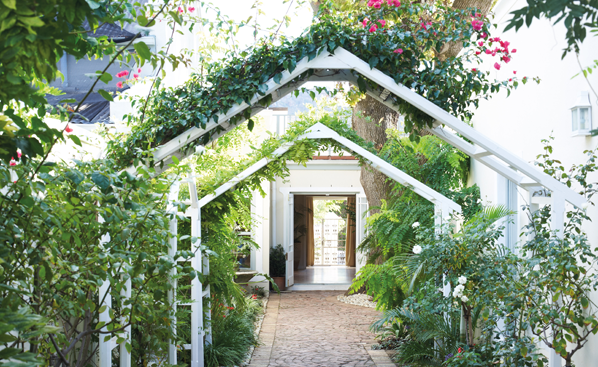 It’s a hidden gem in a gardener’s delight about 25 minutes from Cape Town. Here, in the safety of the city’s prosperous rural suburb, holidaymakers will escape the masses and the bright city lights. The hotel offers the magic in charm, the comfort in sanctuary and a garden that shouts abundance. The crystal pool water, clear blue skies and heady scent of fragrant blossoms add to the value of discovery – a value that is priceless. Accommodation comprises nine spacious en-suite bedrooms one of which is a family suite with everything a young teenager could wish for, and offers parents peace of mind. Two suites have private plunge pools. Among the local wine-estate attractions are Groot Constantia, Klein Constantia and Buitenverwachting. These farms, in a valley renowned for being the oldest wine-making region in the southern hemisphere, are a fine example of the Cape’s matchless, international, award-winning product. Steenberg golf course has to be seen to be believed. A few minutes’ drive from the hotel, the 18-hole championship course meanders through vineyards, pine plantations and waterways and, arguably, has the best greens in Cape Town. A meal at the award-winning La Colombe restaurant is a must. 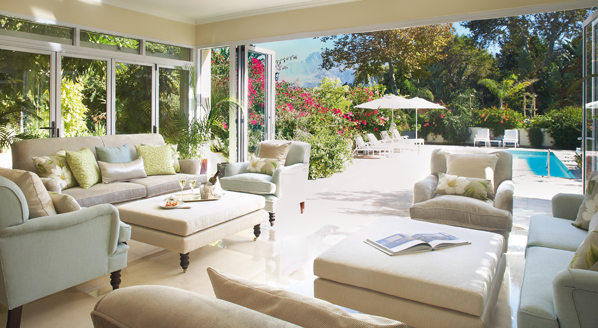 Activities in the area include boutique shopping in Constantia Village and High Constantia, wine tasting at one or more of seven wine estates on the Constantia Wine Route, three championship golf courses, world-class restaurants, walking trails, Constantia Sports Club & Gym, Peddlars On The Bend restaurant and township tours. For an exceptional shopping experience Intimate Rarities in The Last Word Constantia has established a reputation for offering bespoke works of art in a tranquil setting. Browsers are assured peace and tranquility as they choose between hand-crafted jewellery and ceramics, custom-made bathroom amenities, as well as one-of-a-kind handbags, chic clothing and The Last Drop from the world’s most exclusive spirits company. Each item on sale promises to raise a smile for its matchless exclusivity. High Tea is another inimitable experience in The Last Word’s collection of memorable indulgences. Set in The Last Word Constantia’s park-like gardens, visitors appreciate yesterday’s charm mingled with today’s magic. Whatever the weather, the surroundings will enchant. Booking is essential as numbers are limited to ensure intimacy. The Last Word Long Beach on the sea front in Kommetjie is about an hour from the city centre. It’s evident why this property was the voters’ favourite in the 2009 and 2010 World Travel Awards for South Africa’s Leading Beach Hotel. It’s spacious and uncluttered. All six suites are sea and mountain facing and discreet touches such as the sun hats, and towels in a beach bag, illustrate there’s pride and pleasure in charming guests with exclusive experiences that, in time, will become lasting memories. Apart from the picture-perfect scenery presented along Ou Kaapse Weg and Chapman’s Peak Drive which are the routes to Kommetjie, the hotel offers unsurpassed, uninterrupted vistas over the ocean to Hout Bay. Leisurely walks or horse riding along the eight kilometre stretch of beach, and nature trails in the mountains, are among the activities the area offers. For those who revel in history Slangkoppunt Lighthouse is a site dating back to 1914. Activities in the area include premier surfing, lobster fishing (in season), horse riding on the beach, township tours, baboon walks, lighthouse tour, walking trails (beaches, fynbos), marine bird watching, Noordhoek Farm Village, Chapman’s Peak drive, Cape Point Nature Reserve, Cape Point Vineyards, whale watching. None would argue that Cape Town is the beauty spot on the African continent and, in an endeavour to share the city’s unique features with guests The Last Word has extended its horizons to include Racontours to help visitors uncover Cape Town’s precious gems. This is a one-of-kind opportunity to engage with nature. It’s a learning experience which offers personalised adventures along roads less travelled. The Strandloper Safari uncovers the rich diversity of marine life along the Cape’s living shores while The Fynbos Explorer reveals the colourful indigenous flora for which the Cape is world renown. The Little Wine Journey takes guests behind the barrels to some hidden secrets of extraordinary winemakers responsible for remarkable wines and, under the Table, between the Lion and the Devil, The Old Cape Town Ramble brings sailor, settler and slave history to life. Apart from the tours mentioned, other activities in the portfolio range from ‘sedate’ excursions to pursuits which will challenge even the most hardened adrenalin junkies! The Last Word’s particular brand of warm, genial, irresistible hospitality will be indelibly imprinted on a guest’s memory.